Dr. Mohamed Jameel Ahmed (born. 13 October 1969) is a prominent legal practitioner and reformist politician. Jameel is notable for having served on three successive Cabinets. Before embarking on a successful political career, he had also served as the Chief Judge of the Criminal Court. A founding member of both the Dhivehi Rayyithunge Party (DRP) and the Dhivehi Qaumee Party (DQP), Jameel joined the Progressive Party of Maldives (PPM) in 2013. He was elected as the 4th Vice President of Maldives on the PPM ticket of current President H.E. Abdulla Yameen Abdul Gayoom. In a tense run-off, the Yameen-Jameel ticket of the PPM-led Progressive Coalition (51.4%) defeated the MDP ticket of Former President Mohamed Nasheed and Dr. Musthafa Luthfy. President Yameen and Vice President Jameel took their oaths of office on 17 November 2013 for a five-year term. Born and raised in the humble yet pristine surroundings of the southern atoll, Fuvahmulah, Jameel began his passionate journey of academic excellence at the International Islamic University in Malaysia (IIUM), where he completed his Bachelor of Law certification in 1996. Two years thereafter, he completed reading for a Master of Comparative Law degree in Islamic and Civil Law, also at IIUM. He specialised in Banking Security legislation. After completing his postgraduate studies in Malaysia, Jameel returned home to start what would be an illustrious career that would place him at the very heart of a decade-long legislative reform movement in the country’s governance sphere. His academic and scholarly interests were not shelved during his legal counselling and concurrent meteoric rise in the country’s political arena. Jameel completed his PhD in Criminal Law from the illustrious School of Oriental and African Studies (SOAS), University of London, on a Commonwealth merit scholarship. He wrote his thesis in Criminal Law, a field in which he today aspires to implement his ambitious campaign manifesto pledges. Throughout his thirteen-year academic career in the Maldives, Jameel had earned the respect of his peers and love of his students, in his role as a part-time lecturer at local academic institutions. Admired for his energy, determination and focus in his professional and public engagements, Dr. Mohamed Jameel Ahmed is also an eloquent orator. Utilising this skill in his academic endeavours, Jameel continued to find time for workshops, seminars and research presentations in his beloved legal profession. In politics, Jameel highlights his extensive island visits across the length and breadth of the archipelago and his subsequent close interactions with the people as his most valuable experiences. 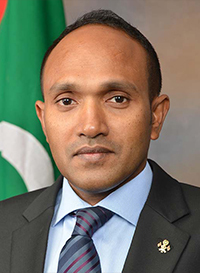 Jameel’s political career began with his appointment as Minister of Justice (14 July 2005). Since his return home after concluding his postgraduate education in Malaysia, he had served first at the Attorney General’s Office as a State Attorney (20 January 1996 – 19 August 1998), as Chief Judge at the Criminal Court (18 September 2000 – 8 February 2005), and finally as the Executive Director at the Justice Ministry (8 February 2005 – 14 July 2005). Jameel was part of a reform cabinet and was a vital cog in Former President H.E. Maumoon Abdul Gayoom’s agenda for democracy, human rights and reform. Mohamed Jameel Ahmed shot to prominence both locally and internationally as a member of the “New Maldives” team of cabinet ministers driving the reform agenda. From 2005 to 2007, Jameel also served on the constitutional assembly, the People’s Special Majlis, to draft a brand new Constitution. His appointment to the Cabinet coincided with the introduction of pluralist multiparty politics in the country. As a member of the Dhivehi Rayyithunge Party (DRP), Jameel was elected to the Party’s Governing Council with the highest votes at the 1st Party Conference. In 2007, Jameel left the DRP and featured among the founders of the Dhivehi Qaumee Party (DQP). As a member of the victorious MDP coalition of 2008, Jameel returned to the Cabinet (12 November 2008), this time as Minister of Civil Aviation and Communication. The disintegration of the MDP coalition, President Mohamed Nasheed’s strong arm tactics and attempts at unconstitutionally influencing the independent judiciary culminated in an attempt to cleanse the government of all reformists, including Jameel. From that day until the resignation of President Nasheed on 7 February 2012, Jameel was at the forefront of the opposition movement calling for respect for judicial independence, rule of law and democratic principles. President Nasheed’s callous and heavy-handed attempts at silencing his critics reached its peak with the arbitrary arrest and detention of Jameel (who was by then the Vice President of the DQP) no less than five times in a single week. The fall of the Nasheed regime brought in a coalition government led by the then Vice-President Dr. Mohamed Waheed Hassan. This time, Dr. Jameel was appointed to the single most powerful and largest portfolio of Home Minister. He was removed from his post (on 11 May 2013) after joining the Progressive Party of Maldives (PPM), founded by Former President H.E. Maumoon Abdul Gayoom and being appointed unanimously by the Party Council as the running-mate to the Party’s presidential candidate, Abdulla Yameen Abdul Gayoom. Throughout his brief tenure as Home Minister, Jameel worked tirelessly to inject added professionalism to the Maldives Police Service, improve the conditions of the Department of Penitentiary and Rehabilitation Services, improve relations between the executive and the elected local government representatives through the Local Government Authority, and increase efficiency of key service nodes such as the Department of Immigration and Emigration, Department of National Registration and National Centre for Information Technology. With his third appointment to the Cabinet in successive governments, Jameel had also entered the country’s governance history books. He became the only individual to have been included in three successive Cabinets, that too in administrations of three different presidents and to different portfolios. With his assumption of office as the new Vice President, Jameel added to his mounting records by featuring in four successive Cabinets. Following a successful presidential elections campaign that took Dr. Mohamed Jameel Ahmed to almost every atoll in the Maldives, he took his oath of office (17 November 2013) for a five-year term as the Vice President of the Republic of Maldives.